Bulgaria is located in Southeast Europe, in the heart of the Balkan Peninsula. The terrain is varied, containing large mountain massifs, fertile valleys, eternal meadows and a beautiful coastline along the Black Sea. Bulgaria shares a border with Turkey and Greece to the South, Macedonia and Serbia to the West, across the Danube River is Romania to the North and the Black Sea to the East. The capital, Sofia, lies in the western region of the country. Sofia airport provides convenient connections to major destinations around the world. The airports of Varna and Burgas also accommodate international flights, although some of the flights may be available only during the busy summer season. 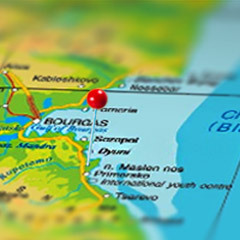 Varna and Burgas are also the primary sea ports offering marine transport to Bulgaria. Rail transport in Bulgaria is readily accessible and the rail network services all major cities and towns around Bulgaria. The railway lines cross all land borders of Bulgaria as well, and the famous European Orient Express crosses the country. Bulgaria is also a transport crossroad, affording access to Western Europe, the Near East, the Middle East and the Mediterranean. A series of major European transport corridors pass through Bulgaria. The official time in Bulgaria is Eastern European Time, which is two hours ahead of Greenwich Time. Bulgaria has a continental climate, influenced by the Black, Aegean and Mediterranean Seas. The country is predominantly sunny and there are full four season. Each season is beautiful and creates a different reason to visit Bulgaria. The summers are hot and ideal for sea tourism, as the sea water temperature is often close to air temperature. Summer is great in the mountains s they provide a cool escape and offer great opportunities for hiking. The colors of the spring and fall are beautiful and the mild temperatures are comfortable for exploring the cities and historical landmarks. The winters are cold and plenty of snow falls, especially in the mountains, thereby allowing for great ski and snowboard seasons. Bulgaria is a member of the European Union as of January 2007, thereby enforcing the General Visa Policy of the EU. Currently Bulgaria issues only national visas, which do not give visitors permission to enter the Schengen area. For further visa information, please check the official website of Bulgaria’s Ministry of Foreign Affairs - www.mfa.bg. The official currency in Bulgaria is Bulgarian Lev (BGN), and since 1997, the country has been governed by a currency board and the value of the lev has been tied to the Euro, at a fixed rate of 1 EUR – 1.95583 BGN. Currency exchange is offered in all banks, as well as at many currency exchange offices throughout the country. Most hotels and stores accept credit cards, as well as many restaurants in the major cities.